As part of a small intimate tour, Bombay Bicycle Club are performing an acoustic gig at St. Paul's Church in the Jewellery Quarter tomorrow night. Doubtless much if not all of the set will feature tracks from their new album "Flaws", released on Monday. Unfortunately the gig is sold out! I arrived home from Plymouth yesterday to see news reports of the crush injuring 60 people at Millennium Point. Watching the video coverage above it seems cancellation was the only option. But that's about the only thing the organisers got right on the day. Where was the emergency access? Who on earth didn't realise JLS would attract that many people at a free event? We need a full investigation now. The Christmas lights switch-on has become increasingly popular year-on-year and adding acts such as JLS and the Sugababes was only going to increase the demand. Any future free events like this should be wristbanded in advance to protect capacity, keep people safe and prevent such a stupid incident happening again. It's a small price of inconvenience to pay for ensuring people's safety. Update: This new question on Help Me Investigate will be worth following. This Saturday saw the showpiece event of the Oxjam Brum festival as six venues, 40 bands and hundreds of gig-goers demanded action on climate change until they were blue in the face. We're still in process of counting all the money but early indications show we raised approximately £3,000 for Oxfam. AWESOME! I looked after the volunteers on the day and was bowled over by their commitment to the cause, most people turned up early and worked far later than they had been asked to. They also persuaded the majority of punters to back the Oxfam "Here and Now" campaign by getting their faces painted blue. GREAT WORK! I caught some of the acts at Island Bar, including Is I Cinema, Idiosync and Tantrums - all were great and all had big crowds. Northfield-based Tantrums are a band to watch with their hat-tip to Birmingham's musical past. 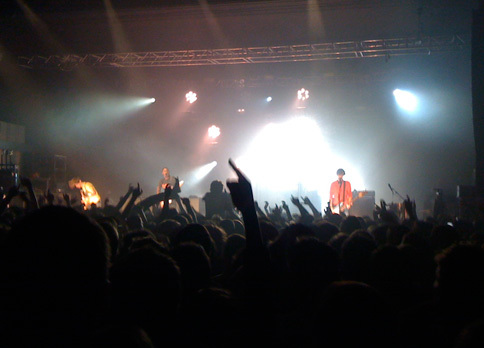 They bought into the day big style, appearing on BBC WM's Janice Long show in the morning and hanging around supporting many of the other bands. If you want to check them out, they're playing the Flapper on 9th November with Youves. We've had some fantastic feedback since the show but we'd welcome any more - positive or negative. I am hoping the nationwide festival as a whole is as successful as our event was and that Oxfam choose to continue it next year - I'd certainly be up for doing it again! If you're wondering why we did all of this, please spend a few minutes browsing the Oxfam website which is currently dominated by the Here and Now campaign. Watch some of the video clips and please, sign up to the campaign and donate £1 a week, if you can afford it. Oxjam Brum – This Saturday! 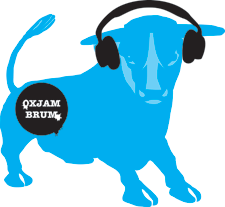 This Saturday finally sees the showpiece event of the Oxjam Brum festival, as six of Birmingham's premier gig venues turn blue to help fight poverty! I'm proud to have been involved with this year's Oxjam as the Community Participation Coordinator, responsible for involving as many volunteers in the project as possible - through encouraging them to host their own Oxjam events to volunteering on Saturday. The "blue faces" campaign (demand action on climate change until you're blue in the face) has been a huge success all through the year - and we're hoping to paint over 200 faces this Saturday! We'll also be promoting The Wave which takes place on 5th December, just before the crucial global climate change talks in Copenhagen. The big names playing include Dinosaur Pile-Up and Tantrums, with a whole bunch of local artists performing alongside them, across the Flapper, Island Bar, Victoria, Basement, Sunflower Lounge and the Prince of Wales. Tickets are still available online until Friday night and cost JUST £6! A ticket to see just ONE of these acts could cost more than that. It's an absolute steal, so be sure to get yours now! On the day you'll need to head to Basement Bar (next to Greggs at the Victoria Square end of New Street) to exchange your tickets for wristbands. You can also buy wristbands on the day. 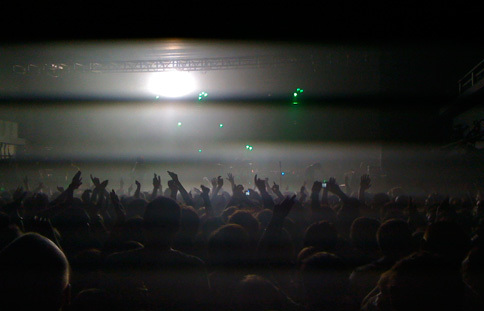 Last night I paid my first visit to the relocated Birmingham 02 Academy and thoroughly enjoyed the gig and the venue. The old Dome makes a wonderful new home. The main room is very similar to the old Academy venue with a large floor and upstairs balcony, but there are improvements including numerous bars placed around the room, rather than in one area. I’m looking forward to enjoying many more gigs at the new venue. 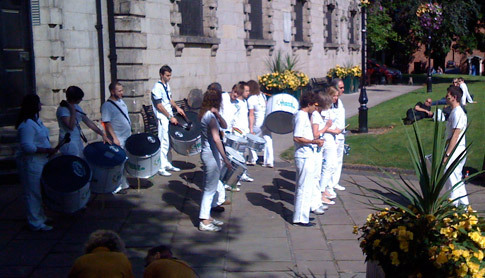 One of my personal highlights of ArtsFest this year was stumbling across a samba group as I wandered through St. Paul's Square. The sounds may have been Brazilian, but these folk come from the heart of Ladywood! Bloco Louco is a community samba percussion group who hold weekly workshops at the Ladywood Arts & Leisure Centre. They were formed in 2007 and attract members from a wide cross-section of the community. They practice every Tuesday from 7.15 to 9.45pm. No prior experience is necessary so please do pop along if you're interested in learning more about samba. Looking at those buried in the cemetery from Birmingham's past including the Bird family, Joseph Chamberlain and Robert Lucas Chance. The highlight of Sunday will be sets from Reverend & The Makers, Athlete and Birmingham's own Johnny Foreigner, all live in Centenary Square. Also worth checking out is "The Fear of Queer", a performance exploring homophobia from the Pink Space Theatre Company, ahead of November's SHOUT Festival. Release the Goddess within. Bellydancing with a Bollywood mix! Sax to the Max. Auditory and visual saxophonic treat. The Fear of Queer. An explosive, contemporary, theatrical exploration of homophobia, intolerance and prejudice through a fusion of physical theatre, movement, dance, music, lyrics and performance poetry. Indie / funk / electro from Sheffield's finest. ArtsFest continues its weekend in the Jewellery Quarter, combining with Heritage Open Day Weekend events. The Museum of the Jewellery Quarter is open for tours, you can see work from Birmingham's contemporary artists at the RBSA Open Exhibition, visit The Pen Room, or have a wander around St Paul's Church and enjoy a BBQ!. Plus don't miss the latest work from Stan's Cafe at the A.E. Harris factory - "Giant Steps". The Hamlet Globetrotters. Comedy sketches based on Shakespeare. Indie pop: imagine Elvis Costello writing for ELO fronted by James Dean Bradfield's younger siblings! Birmingham's Young Poet Laureate event. Have your portrait taken professionally. Professional photographers guided by the public will take as many portraits as possible of visitors to ArtsFest. Rainforest Symphony. Birmingham's dynamic participatory theatre company igniting children's imaginations. Latino Grooves: Latin meets classical. Voice / movement workshop for over 16's. Bringing Shakespeare alive for young people. City Living. Interactive exploration into people's travels. Enjoy world-class performances culminating in a spectacular fireworks display. Live hip hop, funk, drum n' bass.